Exhibit opening: From Farm to Suburb: The Birth of College Hill - February 21, 2016 ~ The History Girl! If you live in the College Hill section of Maplewood or the surrounding area, you may have wondered how this neighborhood came to be. It wasn’t always a suburban community and didn’t always feature streets named for famous colleges: Amherst, Bowdoin, Colgate, Harvard, Oberlin, Rutgers, Wellesley and Yale. In fact, the moniker “College Hill” is only as old as the College Hill Neighborhood Association, formed in the 1990s. 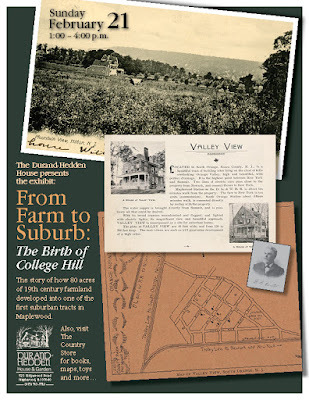 The birth of College Hill is part of the story of late 19th and early 20th century America. Society was changing, with many seeking to leave crowded, industrialized cities for the country. Maplewood, with its open farmland and easy access to roads and railroads, was an appealing choice for developers and for home buyers. At Durand-Hedden’s exhibit, From Farm to Suburb: the Birth of College Hill, you’ll see maps and images of what College Hill looked like when the Trimpi brothers, successful businessmen from Newark and New York, purchased 80 acres of Courter and Arcularius grazing land between the Newark-Springfield Turnpike and Tuscan Road in the 1890s. Follow the story of how these developers transformed the land into the suburban Trimpi Tract, which they named Valley View. See historic drawings of the original seven Valley View houses models, designed by architect W. Frank Bower in the Queen Anne and Four Square styles and an exploration of other architectural styles built over time. The extensively researched exhibit continues the story to the neighborhood we know today. Check out our Country Store’s historic-themed treasures: early American games, books, and toys; facsimile documents; quill pens and ink; historic cookbooks; cookie molds; tin lanterns; and reproductive decorative items and ceramics. You’ll also discover the hard-to-find original Doors of Maplewood poster, Smile: A Pictorial History of Olympic Park 1887-1965, and the new acid-free reproduction of the charming 1931 Map of Maplewood. The Country Store is open every Saturday and Sunday from 12:00 noon - 5:00 pm.